We are starting something new at Yoga Killarney! We’re calling it, “Top 5 Friday.” Each Friday, we will release a top 5 list that relates to yoga in some way or another. This week, we are picking our 5 favourite hip flexor stretches. Next week, who knows…! Check out this page every Friday for something new. High Lunge. This pose usually ends up in your warm-up. You know it well. A basic lunge position with your arms overhead. A high Lunge is a good pose to start with when stretching the hip flexors because it is the most gentle of the bunch. Throw a few high lunges into your sun salutations and you will be on your way to releasing tension in the front of the hip. Low Lunge/Crescent Lunge. Once you are warmed up, a low lunge is great for continuing to open the hip flexors. You can add an extra dimension to the pose by interlacing your fingers overhead and looking towards the ceiling for a Crescent Lunge (when you look at this pose from the side, your arms and leg form a crescent moon shape!). Lizard. This pose is either loved or hated, depending on how flexible the hip flexors are, but it is a wonderfully deep stretch for the hip flexors. Make sure the body is truly warmed up before getting into this pose! Dancer. After some high lunges, low lunges and a good sit in Lizard pose, now it’s time to have fun and stretch the hip flexors in poses that require openess in the front of the leg. Dancer pose, for instance! 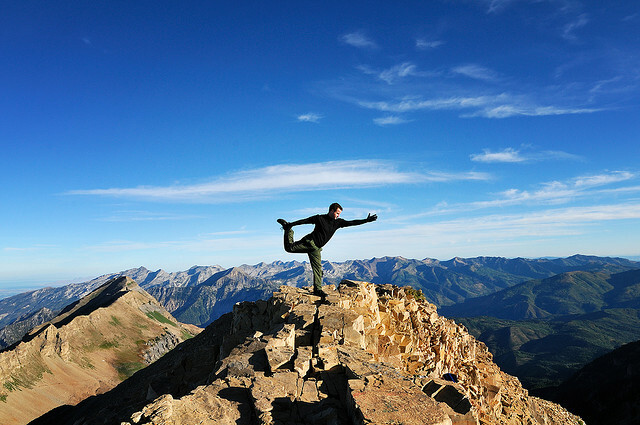 The man in the image above is giving us a nice example of this challenging balance pose. Bow. Now we are coming down on the mat, lying on the belly and taking advantage of the openess we have created in the hip flexors. Bow pose is a lovely pose to add towards the end of your practice to give those hip flexors a final stretch. Without openess in the front of the leg, coming into this backbend would be much more difficult and much less satisfying. There you have it. Our inaugural Top 5 List. Now go stretch out those hip flexors, and we’ll see you next Friday for another insightful or possibly goofy list!